Late on March 12th Police Superintendent May received details that a woman in Porthcawl had been shot by a German prisoner on the run. The woman, Mrs Lily Grossley, was not dead but doctors were fighting for her life. In her initial police statement, she claimed that German prisoners had shot her when she refused to give them her handbag. Her husband, Howard Grossley, was also involved in the incident, but he was unharmed and the prisoners had run off. However, by the next morning Tuesday 13th March 1945, police had started to unfold an unusual story. 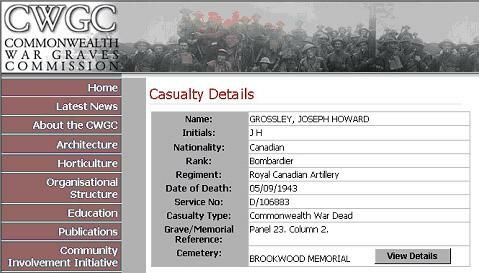 Howard Grossley was a Canadian soldier with a wife in Canada. Mrs Lily Grossley was not Mrs Grossley at all. Her real name was Lily Griffiths, and she and Howard Grossley had been living together and were the parents of a two year old son. Howard Grossley was A.W.L. (Absent Without Leave) from the army and was staying in a guest house in Porthcawl which is only a few miles from Island Farm. Howard Grossley gave a police statement that claimed that on the night of the12th March 1945, he and Lily were taking a late night walk. Whilst walking down a lane near to the guest house, they had been threatened by German POWs who tried to steal Lily's handbag. In defense Howard Grossley had used his revolver, which he was carrying, to threaten the POWs away. However, as the POWs had made their escape down the lane, Howard Grossley had fired a shot and in so doing had inadvertently shot Lily Griffiths. Initially, Lily Griffiths backed up Howard Grossley's statement. But as the realisation that her injuries were more serious, she changed her statement, maybe in an attempt to help Howard from imprisonment. He had previously suffered horrific phospherous burns to his back, was in constant pain and was therefore on high medication. On the night of the shooting he had been drinking which mixed with any medication could have enhanced his depression or affected the way he was feeling. He was A.W.L. from the army and he hated the shame of this. He hated having to lead his double life due to the fact that he was already married. Lily Griffiths stated that, whilst walking, Howard Grossley said that he was going to end his life. During a wrestle for the gun, as Lily tried to stop Howard killing himself, he had inadvertently shot her. Lily Griffiths died Friday 16th March 1945 as a consequence of the gun shot (collapsed and septic lung) and Howard Grossley was charged with her murder. "Howard Joseph Grossley on the 12th day of March 1945, in the County of Glamorgan, murdered Lily Griffiths"
He pleaded "Not Guilty". The presiding judge was J. Singleton and Howard Grossley was represented by Messrs. Stockwood & Williams of 3 Court Road, Bridgend. 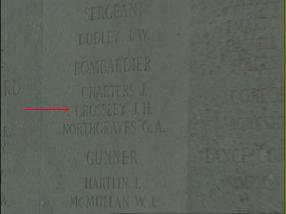 Catherine Davies (Lily Griffiths' sister) - Wife of Clifford Davies - Cwmaman, Aberdare. Frank Stanley Rowe - Mason - Porthcawl. The trial lasted two days and on the 12th July 1945, Howard Grossley was found guilty of the murder of Lily Griffiths. He appealed and his appeal was heard on 21st August 1945. However, the verdict of murder was upheld and Howard Grossley was sentenced to death by hanging 5th September 1945 (aged 37 years). His body was buried within the Cardiff Prison Cemetery....or was it ? Related Link: 6th October 2003, BBC News web site: Howard Grossley's body is to be exhumed to permit the building of a new cell block at Cardiff Prison. 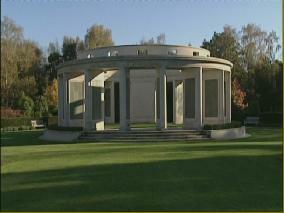 Click here to view BBC web page. NEXT OF KIN: Mrs Marie Goulet Grossley (Wife), Burlington, Vermont, USA. 1933 – 1937 Employed by Underwood & Elliot-Fisher Typewriters Co (Hartford, Connecticut, USA) and worked in the factory as a Drill Press Operator and earned $55 per week. 3rd August 1940 Attached for all purposes to Petawawa Military Camp, Petawawa, Ontario. 4th August 1940: Taken On Strength (T.O.S) Royal Canadian Artillery (R.C.A) 2nd Canadian Division. 21st August 1940 Embarkation at Halifax, Nova Scotia, Canada. 4th September 1940: Disembarkation at Gourock, Glasgow, Scotland, Great Britain. October 1940: Service Record makes initial reference to being based at Aldershot, England. 15th October 1940: Admitted to Duke of Connought Hospital, Aldershot, England. 18th – 26th December 1940: Privileged Leave. 28th October 1940: Hospital stoppages (14 days). 11th February 1942: Provisional leave 11th February 1942 – 18th February 1942 4.4 no warrant. 16th May 1942: Ceases S.I.Q. 8th - 9th June 1942: S.I.Q. 19th - 20th June 1942: S.I.Q. 4th November 1942: Returned from P.L. Well built, clean cut N.C.O somewhat worried about his general state of health and the care of his son worries him. Separated before he joined up, he made a false statement about his marital status. The Government caught up with him, cut off the allowance, which he is now paying back to the Government. He is now unable to do much for his son. Apart from these problems he is happy in his work. Howard Grossley's medals and awards were forfeited upon his execution. Although the medal was usually awarded to Canadians for six months service in Britain between 03 September 1939 and 08 May 1945, the exact terms were: Service in the forces in non-operational areas subjected to air attack or closely threatened, providing such service lasted for three or more years. Service overseas or outside the country of residence, providing that such service lasted for one year, except in territories threatened by the enemy or subject to bomb attacks, in which case it was six months prior to 02 September 1945. The Canadian Volunteer Service Medal was granted to persons of any rank in the Naval, Military or Air Forces of Canada who voluntarily served on Active Service and honorably completed eighteen months (540 days) total voluntary service from September 3, 1939 to March 1, 1947. A silver bar (often called a clasp), a maple leaf at its center was awarded for 60 days service outside Canada. A silver maple leaf is worn on the ribbon in undress.